Father George B. Moore, 76, pastor emeritus of St. Benedict Parish in Philadelphia, where he joyfully ministered for 35 years, died Dec. 19. Born in Philadelphia, the son of the late George Boyce Moore and the late Jean (Santilla) Moore, he attended St. Callistus School and St. Thomas More High School before entering St. Charles Borromeo Seminary. He was ordained May 21, 1966 by Archbishop John Krol at the Cathedral of SS. Peter and Paul. His early assignments were as parochial vicar at St. Timothy, Philadelphia; St. Mark, Bristol; St. Raymond of Penafort, Philadelphia and St. Ignatius of Loyola, Philadelphia. 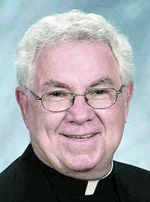 When he was appointed pastor of St. Benedict in 1978 he was the youngest pastor in the archdiocese and remained there until he was named pastor emeritus in 2013, at which time the parish merged with St. Athanasius Parish. A Reception of the Body liturgy was celebrated Monday, Dec. 29 at St. Benedict Church followed by a viewing and a Mass. Msgr. Richard Youtz of the Harrisburg Diocese, who preached at Father Moore’s funeral Mass, was a seminarian with him at St. Charles and the two of them became best friends. They served their “Thursday Apostolate” as seminarians together at Most Precious Blood Parish in Philadelphia, where he got his first taste of ministry in the African American community, which really became his life’s work. Father Moore was a died in the wool, win or lose Phillies and Eagles fan, and on vacation the two priests traveled the country visiting the various ballparks. Father Moore was a simple man, usually wearing an old sweater, regardless of the nice gifts his friends and family would give him that are still in the closet with the tags on them. “The people thought he could walk on water,” said Theodore Travis Jr., a 50-year member of St. Benedict’s. Another viewing for Father Moore was held on Tuesday, Dec. 30 followed by his funeral Mass celebrated by Bishop Timothy C. Senior. Concelebrants included Msgr. Samuel Shoemaker, Fathers James A. Grant, Joseph F. Okonski, Christopher Walsh, Redemptorist Father Anayo Nna, Vincentian Father Sylvester Peterka and Msgr. Youtz. Father Moore is also survived by his sister-in-law, Gail Moore, and nieces, nephews and cousins.